My name is Cory Minter. I am the president of Trinity Employment Specialists, a Tulsa staffing company. I’m going to talk just a couple minutes about how to do a telephone interview. I get asked about this occasionally and I thought it might be appropriate to share a couple of hints on what to do when you’re doing a telephone interview. It’s quite different than a face-to-face interview. Some people are really good at it, by the way. Then some people are really, really awful with it, but I’ve noticed that as time has become the new money with most people, businesses are choosing to do telephone interviews before they actually have someone attend an interview on-site. Trinity is a staffing company so we have a pretty good gauge on what a lot of companies are doing. I think what most people are going to start seeing in the next few years is having a lot more first interviews be over the telephone or video. I think that can be advantageous for some people and it can really be a disadvantage to others. I want to throw out four or five things that I think will help somebody in doing this. I’m just going to run into it and and see if any of these tips help you. The first thing that I notice is when somebody is chewing gum, drinking, eating or doing other things. It’s really important that you pay attention to those things. Some people chew gum. It’s so noticeable on an interview. Really it’s just flat out annoying when you hear it. If you don’t believe me, just remember the last time you were talking to somebody who was chewing gum while you were trying to talk to them. It’s just really distracting. The second thing is make sure there isn’t a lot of background noise that’s going on in the background. Even shooting this video right now, it is so easy for just some background noise and it would be really distracting for you if we had something going on in the background or a lot of noise happening. It would just be hard for you to pay attention to me. Same thing with an interviewer that’s interviewing you. The things that I notice and the hardest things to deal with me as an employer is if there are babies that are crying in the background. Sometimes it’s no one’s fault, but there is just no way that you can get anything done. If you have a young child that you think might be quiet for 30 minutes, I would recommend that you try to find an alternative to that because right when you think that they’re being really good, if they have one small thing go on it could really distract you and the interviewer. Just make sure there’s no unnecessary background noise. You have a quiet place that you can go and talk for a little while. The third thing is to speak enthusiastically. Speaking with enthusiasm is so very important. I want to give you some hints that I’ve learned in doing not just telephone interviews for me, but closing deals on the telephone is really important for me, but interviewing on the telephone, it’s really important that you speak enthusiastically and you come across as sounding interested, excited, that you are a go to type of person, that you are a go-getter type of person over the phone. The last thing you want to sound like is someone who is tired, lazy, and you might not even be that person, but if you’re laying on the couch rather than standing up and talking, it could come across in the influx of your voice. You don’t want that to happen. I really recommend to people stand up when you’re doing a phone interview. There is something that happens when you stand up in the influx of your voice. You create a little bit more energy. Your voice raises just a little bit, and it’s a natural way for you to sound more exciting and more excited on the phone. People who are excited also sound more competent and confident and that’s the way you want to come across over the phone because at that point that person has never seen you. You don’t get the opportunity to have non-verbal communication. You’ve got to do everything you can over the phone. Second thing is there’s something about smiling when you are talking that raises the tone of your voice and raises your energy level just a little bit. Standing up and smiling will help your tone come across a little better and increase how confident you’re going to sound over the phone. I think when you do that rather than sitting down, because it’s really easy for you to want to sit down, slouch, maybe even lay down while you’re doing an interview. I’m telling you, you might not intend for it to, but that will come across in your voice, in your intonation, in the way that you sound. If you’re going to do a phone interview make sure that you do these things to help you sound a little bit better to somebody who’s never seen you before. The third one is, okay. The next thing is to let the interviewer guide the process. Try not to take too much control over the interview. Let them be the leader and answer their questions as they ask. Just make sure that you add as much information as you can to the questions they ask. 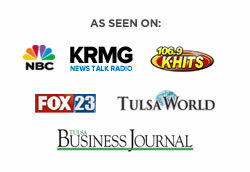 Are you looking for a Tulsa staffing company? Make sure that you take notes so that you can keep track of what it is that they are interested in. Take notes of the things that they mention that they are wanting from this person, so that if you do get a second interview that’s in person you can address these things. It will make you sound a little bit better. Make sure that you take notes and you really listen to what it is that they’re needing. If you listen hard enough they’re probably going to give you a lot of hints on what they’re looking for. That is something you can address later on in the interview. The last thing that I recommend that you do is just have some questions ready so that you can sound intelligent. You can show your intellect with the questions that you ask. It’s almost annoying to me and it really concerns me a lot if I’m interviewing someone and I ask them, “Do you have any questions?” They say, “Nope, I’m all good.” To me it just sounds like that person is just not that interested, they’ve not thought it through. Why wouldn’t they ask any questions? They’re getting ready to spend more time here if we hire them than they will with their friends and family. Why wouldn’t they ask some questions? It just doesn’t make any sense to me. I think most successful people don’t understand that as well. Make sure that you show your intellect with the questions that you ask, so think them through, have them prepared and ask those questions so you can give the best presentation that you can even when you’re asking questions for information for you. I think that will help you in a telephone interview if you ever get asked. I think you’re going to be asked because it’s increasing in popularity. Good luck with your interviews and I wish you the very best!